The Corgi Batmobile was introduced in 1966 and was one of the most successful toys in the company's history, remaining in the range until 1980 and selling millions of examples. 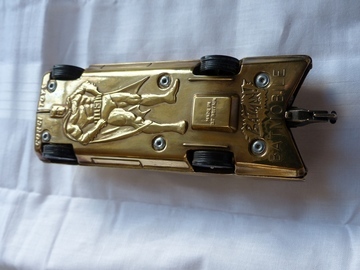 The model featured a pop-out front slasher blade, moving plastic exhaust flame and three rocket launchers on the rear deck as well as Batman and Robin driver figures. Earlier models were fitted with gold hubs with orange "Bat-logos", while later models had WhizzWheels. WhizzWheel models lost the exhaust flame feature. This is one of very few produced in brass - and it looks as good as if it were gold-plated - made for special visitors at the time. It has come from the family of Percy Wilford, Corgi's Senior Model Maker who worked closely with Marcel Van Cleemput at the Northampton factory.